Standing on two feet…I realize this is something we all do every single day with any thought. Well, we need to start thinking about it! The way we stand, the amount of pressure we put on our feet is important. 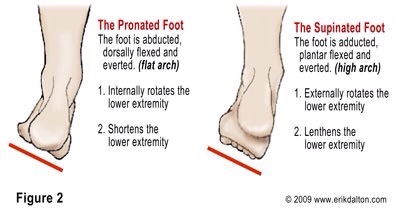 Continually, using our feet improperly affects our posture and keep the chain of imbalance ever progressing. To stand upright, you must balance your body over your feet. Your spine should be aligned over your pelvis, with your weight evenly distributed between your feet. Many people stand with more weight over one foot or with their weight over only part of their feet. While standing, become aware of your feet. You should feel even pressure on the balls of your big toes, little toes and heels. This is the tripod of your foot. If you feel more pressure on one of these points, you are not in alignment. Relax your toes and knees and adjust your weight so the tripods of both feet feel equal pressure. Take a look at your feet…a lot of you are standing on your ankle more than your foot. Many of you have one foot if not both pointing to the side…instead of straight ahead. Look at your toes. Are they bent, curled up, pointing to the side? A lot of these issues can be worked on to help improve function and posture which I turn helps relieve pain. This entry was posted in articles and tagged back pain, feet, muscle imbalance, posterior chain, posture. Bookmark the permalink.